Happy Holidays from Boulder Landscape! We’d like to thank all of our customers for working with us during this challenging yet successful 2018 season. We are already looking forward to 2019! In the meantime, the Boulder team encourages you to spend time with your family, indulge on a few Christmas cookies, take that extra nap with the dog, and cherish what the holidays are really about. We wish you a Merry Christmas and a happy and safe New Year! Autumn greetings from Boulder Landscape! It is hard to believe that Summer 2018 has passed us. The only common theme this summer seems to have been the incredible amount of rain. By far, this has been one of the wettest summers in our memory. In fact, according to our weather resources, we’ve had over 25 inches of rainfall this summer, which is almost 8 inches over the normal! We like to look on the bright side of things, that much rainfall would mean an enormous amount of snow! Which would you rather prefer? Despite what felt like nonstop showers & constant rain delays, our summer was busy! We’ve been active transforming backyard living areas, enhancing front landscapes and walkways, and doing our best to stay on top of maintaining the ever fast-growing-grass. We would like to thank all of our customers for keeping us busy (& understanding it’s been wet!). We are already looking forward to what 2019 has on tap. This summer we also made time to give back. We awarded a Northwest Area High School Student with a college scholarship in the name of our late beloved dog, Lily, who we lost unexpectedly last year. Although we were devastated about losing Lily, we decided as both a team and family that we had to do something positive in her name because she was so special. We know that Lily is happily barking in doggy heaven. Speaking of dogs, Boulder also donated a brick patio area in the newly opened Berwick Community Dog Park. We encourage you to take your furry friend for a quick walk on the next nice fall day! Fall is the perfect time to clean up your landscape in preparation of winter. It’s a great time to install mulch as it will protect root systems from frost and also help keep moisture during the cold and dry winter. It’s also an opportunity to manicure the landscape. Removing annuals, trimming up perennials and grasses, and pruning dead or dying branches from shrubs and trees will keep the landscape looking sharp all winter long. As we look forward to the leaves changing colors, the air feels crisper, the nights are getting cooler; the thought of Thanksgiving & Holiday fun times are right around the corner. Happy Fall everyone! As we are exiting this cold and snowy winter, there are two things on our mind: Spring and warm weather! We are excited to once again exhibit at the 31st Annual Central Susquehanna Builder's Association Home Show! Come meet with our staff and check out our display which will be featuring some of our favorite outdoor living products. There will also be a number of other home improvement vendors at this great event. The show is located at the Bloomsburg Fairgrounds and will run Friday, February 23rd (12-8pm), Saturday, February 24th (9am-8pm), and Sunday, February 25th (10am-4pm). Download the PDF flyer for the show! Happy Holidays from the Boulder Landscape family! The days of warm weather and breezy nights on the patio are gone because the snow & cold weather has officially arrived to Northeast PA. Although winter always seems to creep up on us, we are ready to take on the snow and ice that comes with it. We are fully equipped and excited to see how Winter 2018 keeps us busy! For your paver patio or driveway, use calcium based ice melt products in lieu of rock salt. And as always, check the directions on the bag before you apply! If you have furry friends be sure to use pet friendly ice melt. Calcium & rock salt can be tough on their paws. Remember to stock your vehicle with an extra blanket, flashlight, jumper cables, and first aid kit. You never know when winter weather will hinder a journey. As we all know, the holiday season always goes by fast! We encourage everyone (including ourselves!) to take some time off and spend it with your family. This is the time of the year that we enjoy the most because it brings us all together. To us, there’s nothing better than eating too many Christmas cookies and watching a movie with our families and pets all the while keeping in mind that spring is in the near future… 4 months to be exact. With the New Year just around the corner, we take the time to reflect on our 2017 season. This was one of the most challenging wet weather summers yet we still managed to stay on schedule and complete all of our projects before the cold set on us! We feel incredibly grateful to be actively doing what we love and we cannot thank our new & long time customers enough. Boulder Landscape wishes you a Happy Holiday and New Year from our family to yours! Happy Holidays from Boulder Landscape! Why is it that the holiday season always manages to sneak up on us and before we know it, it’s Christmas Eve? The holiday season means only one thing here in Northeastern PA and that is winter is right around the corner! We know, we are still in denial that the first day of winter is just a few short weeks away, but sadly it’s time to put the patio furniture away and break out the snow shovels. Although snow can be a burden we do have to admit it does have the ability to turn an outdoor landscape into a beautiful and picturesque winter wonderland. The Farmer’s Almanac is predicting this winter to be filled with frigid cold temperatures and above average snowfall for our area. Here are a few tips from us to help you prepare for winter and protect your landscape. 1. Put those outdoor hoses away! Make sure to turn your outdoor water spigots off from inside. 2. Tie up any loose or low hanging fragile branches within your landscape shrubbery. A heavy snow or cold wind could cause branches to break. 3. Winterize your outdoor power equipment. Drain fuel lines and wipe down metal parts with an oily cloth to prevent rust. 4. When the snow & ice begin to accumulate, use calcium chloride instead of rock salt on your paver areas. 5. Think about your outdoor landscape jobs NOW! The winter season is a great time to plan and prepare for spring landscaping projects. With 2017 quickly approaching, we would like to thank you for being a part of a great 2016 season with us! The entire team at Boulder Landscape is incredibly thankful and appreciative and we are looking forward to another year with you. This holiday season we encourage you to spend time with your family and friends, eat a Christmas cookie or two, and always keep in mind that Spring is right around the corner…five months to be exact, not that we are counting or anything. Happy National Dog Day from Boulder Landscape! Dogs play such an important role in people's lives. They are always incredibly happy to see us, faithfully never seem to let us down, and appreciate any attention that we give them. Lily, our golden retriever, greets our staff every morning with a warm welcome of her signature "happy bark" before sending us off to start our day. She is often found hanging out in our office waiting to be petted, jumping in any one of our Boulder trucks in hopes of being taken for a ride, or soaking up the sun on one of the beautiful patios that we created. If your dog enjoys your landscape that we have created, please send us some pictures! We would love to see that our hard work, creativity, and passion can not only be admired and appreciated by our clients, but their dogs as well. Also, when finished reading this, make sure to give your a dog a treat (or two) on us...they deserve it! School is officially out and summer 2016 has begun! Isn't it beautiful to watch the seasons change? The grass is greener, the sky has become the perfect shade of blue, and plants & flowers of all shapes, sizes, and colors are happy to be in full bloom. Fourth of July weekend is right around the corner! (We know, we can't believe it either). This holiday weekend is another great opportunity for you to enjoy the sunny weather with friends, catch some lightning bugs with the kids, enjoy a hot dog or three, and of course appreciate the beauty of your landscape. The weather men and women are predicting temperatures of high 80s and low 90s for the weekend, so not only will it be absolutely beautiful, but also very hot! Remember, your lawn needs to stay watered during these hot spells. Also, don't be afraid to keep the mower deck high. A nice thick lawn is nice on bare feet during a hot day. However, while relaxing in the grass, if you notice it browning and small "holes" all over, give your lawn a dose of grub & insect control. The warm winter made grub season come early so take care of it before it really bugs you! While mentioning the hot weather, be sure to check out the newly developed Ber-Vaughn Pool in Berwick. We were happy to build a paver walkway near the pool area in order to help complete this community pool. We encourage you and your family to check it out! We wish you a safe and happy 4th of July Weekend! Happy spring 2016 from Boulder Landscape! Happy spring 2016 from Boulder Landscape! After one of the strongest El Nino on record, this March’s early flowers are bringing April snow showers! Be sure not to spread grass seed on your driveway and salt on your lawn! As the vitamin D kicks in from the sun’s rays, the snow removal and ice equipment is put away and we begin to bring out the summer landscaping tools and equipment. There is a very important service we strongly believe in and is overlooked by many homeowners and commercial companies: preventative landscape maintenance. We’ve spent these past few cold (or not so cold) months maintaining our gear to ensure it’s going to keep us working all summer long. This principle of maintenance should be applied to your outdoor space as well. Whether it is a small landscape bed, front lawn, or backyard outdoor living area, it is important to establish a proper maintenance program to keep those areas healthy and looking sharp. A maintenance program is an effective and a wise investment. One key word that Boulder Landscape strives to enforce in our services is quality. Quantity has had a tendency to impact quality in recent years. Our commitment to quality will never be overrun by quantity. We at Boulder Landscape will do our part making sure landscape beds and plants are well manicured, patio and wall projects are managed and installed properly, and our customers are treated with respect while ensuring them of the highest quality of workmanship. We are excited about this early spring and hoping to ride the wave of excitement throughout the summer. Come join us! It seems like yesterday we were watching the fireworks and mowing our lawns. Now we are watching the fire and wrapping our gifts while trying to stay warm. We also want you to be safe as you walk out your door. When the snow starts to fall and the need for ice melt arises, know that it is best to use calcium chloride on your concrete paver walkway or driveway. It is our suggestion to use a less abrasive ice melt to keep your concrete pavers looking good for years to come. In case you're a pet lover, make sure to use a pet-friendly ice melt. Both sodium chloride (rock salt) and calcium chloride can be toxic to pets and can irritate their paws. As you enjoy the upcoming holiday season, give thanks to all the great things in your life such as family, friends, and remote car starters! It seems like just yesterday we were talking about spring, too much rain, and fireworks. However, like every year, the leaves are just starting to change and the smell of fall greets you in the morning while the hot summer sun is still crisp during the afternoon. The workdays now consist of irrigation, trimming shrubs, and dusting off the snowplows. Yes, we said it, SNOWPLOWS! Although it may only be the end of August, we all know what is lurking just around the corner. While the days start to get shorter and the mornings a little brisk, we thank 10,000 New York City workers who marched in 1882 to create the first Labor Day. What started as a day of unpaid marching by workers has now turned into a day of celebration and pool closing parties. 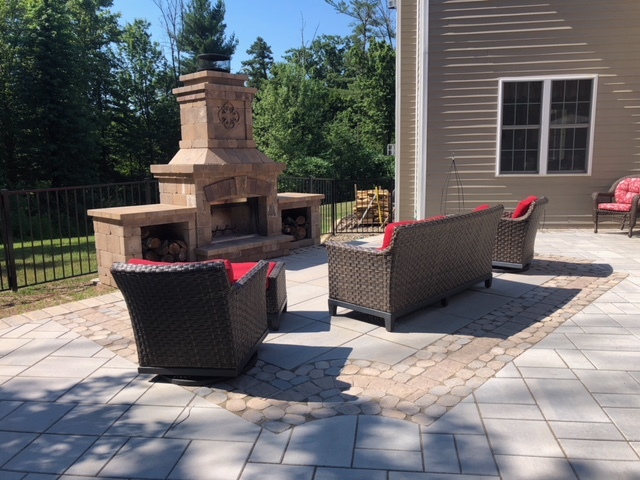 So once again as we prepare to gather with friends and family, let Boulder Landscape, LLC help make the day and the end of the summer season a little better. As the food coma overtakes you after a long day of entertainment and over indulging, the unfortunate event occurs... a leaf falls from a tree and hits the lawn. Then another. You know in your mind that in a month or so the lawn is going to be filled with these beautiful, crunchy pests. But this year, don't fret! Our advice; mow over them! Mulching leaves back into your lawn, with the help of a winter-prep fertilizer, assists in a nice green lawn come springtime. Some also say it helps keep those pesky dandelions away! So take that deep breath at the end of your well-earned holiday and sleep in peace knowing that leaves will be no issue this year. We at Boulder Landscape, LLC would like to wish everyone a very happy Labor Day, along with a lucky sports season, a good school year, and maybe, just maybe, a mild winter. School is out, and the sounds of summer are finally here! Birds greet you as you taste your morning coffee, and crickets say goodnight after a long day's work. You've dreamed of these days while watching the snow fall all winter. Now, Boulder Landscape, LLC can help you enjoy these spectacular summer days a little more. The perfect lawn is ready for the Fourth of July festivities, and the grill welcomes your guests. Our average rainfall this spring has turned the grass into a sea of green, and the added nitrogen that Mother Nature provided helps as a natural fertilizer and makes our lawns even happier. However, the dreaded dry season is around the corner, so here is a tip we recommend. Keep the grass a little higher than normal; this will help during a dry spell. Also, if you have fertilized throughout the spring, mulch your grass back into the lawn rather than bag it. This healthy grass will also help fertilize when the rain forgets to fall. So while you and your guests add to the statistic of 150 million hot dogs eaten over the holiday, raise your glasses to a great lawn and the summer ahead. You earned this holiday weekend! Count their chirps for 14 seconds, add 40, and you will get the current temperature in Fahrenheit. You will probably be more accurate than most weathermen...believe us, we know.